4A is perhaps one of the most striking styles of play. These type of Yo-Yos are characterized by being large, almost twice the regular Yo-Yo's size, but quiet, everything has its explanation. 4A Yo-Yos are not tied to the Yo-Yo string, which is therefore only tied to your finger. The rest is up to you. For a better understanding of this concept, 4A style is very similar to the game of diabolo. By the way, do not fear dropping the Yo-Yo, such Yo-Yos are manufactured with a highly impact­resistant plastic. Knowing this, you can start to innovate. 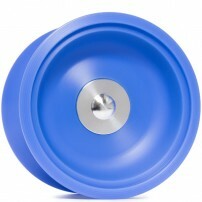 The new AdegleYoYos! model for 4A is the Whale. Manufactured in delrin, excellent quality for Offstring and in blue or white.